Victor Oladipo sinks the game-winning shot against the Spurs. 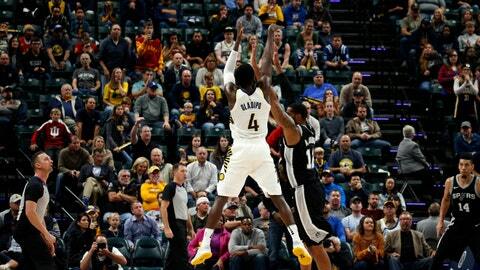 Folks are noticing Victor Oladipo’s strong play to start the season for the Indiana Pacers. Last week, in particular. Oladipo, in his first season with the Pacers after being obtained from Oklahoma City in the offseason, was named Eastern Conference Player of the Week, the NBA announced Monday. It is the first player of the week award in his career. Oladipo averaged 28.7 points, 4.0 rebounds and 2.7 assists per game while leading the Pacers to a 2-1 record during the week of Oct. 23-29. He shot 60.4 percent from the field, 60 percent from 3-point range and 95 percent from the free-throw line over the three games. Oladipo scored 28 points and helped the Pacers set a franchise record for field-goal percentage in a win at Minnesota last Tuesday. He scored a season-high 35 points in a loss at Oklahoma City the next day. And he had 23 points, including the game-winning 3-pointer in Sunday’s 97-94 win over San Antonio. Oladipo has led the Pacers in scoring in all six games this season and ranks eighth in the NBA at 25.5 points per game.